Did you ever watch your mom/elder sister/aunts put on their makeup when you were much younger? My earliest memories of cosmetics were watching my aunts put on their makeup. They were heavily into Indian Classical dance and when there was show, they would sit in front of an old wooden dresser with a worn out mirror and put on their makeup. I would be perched on a big old bed in their room and just stare at their images in the mirror. The memories of my childhood were somehow jolted to life when I came across this product online one day because I distinctly remembered seeing something like this on their dresser. (Its been around since 1935, my friends!) It looked so retro and reminded me for some reason of them and that memory in their room.....They are not around for me to actually verify that it was indeed the same powder they used but I just thought I'd share that with you. 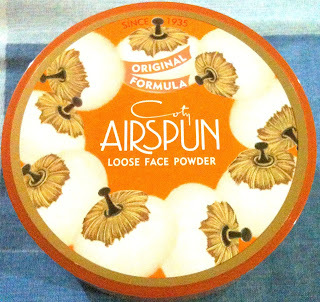 Back to Coty Powder, which is not available here but easily purchased online and is relatively cheap. 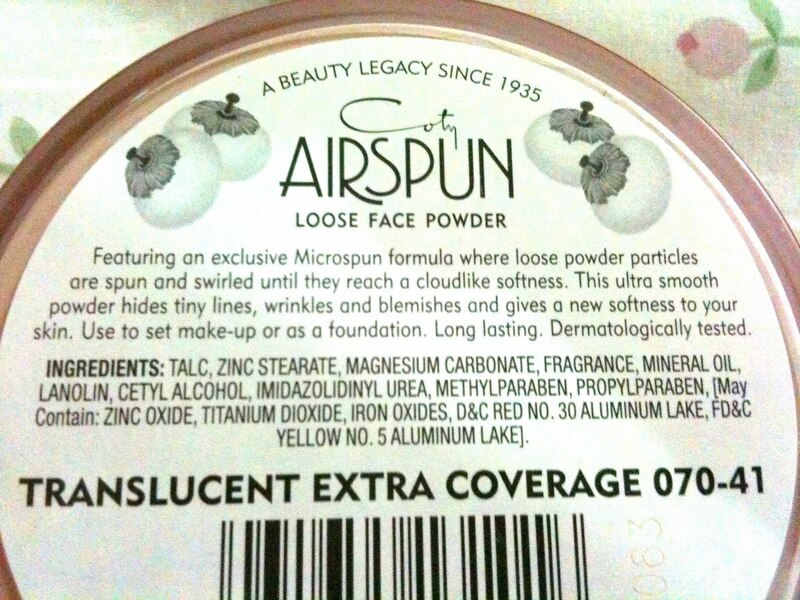 I bought Coty Airspun Face Powder in Translucent Extra Coverage for RM 38! Coty Powder is a finely milled loose powder which you use to set make up and it does so very nicely. The color says translucent but it does have a tiny bit of color which does not bother me as it blends very nicely with my foundation . This one is also and Extra Coverage powder which is buildable and you can add on which is something I have not tried to do as I believe the coverage from my foundation is sufficient. I use my favorite Eco Tools Kabuki brush to pick up the powder and dispense all over my face. I was pleased to note that this powder helps with controlling oil as my face still looks matte at midday which is nice. The packaging has also changed very much for the better as previously Coty was sold in a stiff, round cardboard container and did not come with a sifter. Oh the horror of all that powder flying about as you open the thing! However, they have revamped the packaging recently and it is now housed perfectly in a plastic container with a sifter and a puff (which is totally useless, so don't even bother). I must say, since I discovered the kabuki brush, I have not used puffs to apply my powders at all. It has a smell which I cannot explain but since a small amount is applied on the face, I don't smell it and it does not bother me. 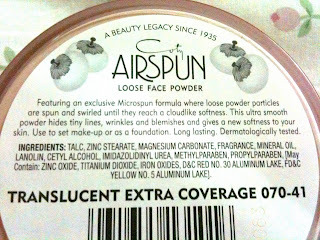 The back of the packaging says that this powder will smooth out fine lines and blemishes. Please take that with a pinch of salt as you will need to apply and build the coverage until that happens. There is plenty of powder in there that it will take ages to get through it so if you are looking for value, then this could be something you consider purchasing.